On the second-to-last day of the trip, we decided to pay a visit to two more cocktail bars that I had located. First was Bar Moderno, at the Aria. Photo by wbeem on Flickr. Prickly Pear Pisco Sour for Ian. BarSol Pisco, prickly pear purée, fresh lime juice, and Fee’s Rhubarb Bitters. I asked the bartender about the lack of egg whites in the sour (they were listed on the menu), and he said they quit stocking them because they went unused and spoiled easily. Ah well. Still, it was enjoyable. The pisco (my first taste of pisco) blended nicely with the prickly pear, so I may have found a use for my Prickly Pear Vodka (another reason I ordered this particular drink). The cocktail was slightly thin, though the egg whites would likely have solved that issue, as would colder, drier ice. A heavier pour on the pisco would be appreciated. Il Cuore di Aria for Matt. Jack Daniels Single Barrel, Pallini Limoncello, Orgeat (not sure which one, but Monin or Fee’s are likely), and “Fresh Sour.” Not as sweet as expected, and nicely balanced in terms of flavor. Slightly thin, as with the PPP Sour. The Single Barrel has a deeper, richer, more enjoyable flavor than regular Jack, which isn’t one of my favorite whiskies, and is to thank for the oomph in the drink. I’ll have to try some of the aged Jack Daniels whiskies in the future! The orgeat was nearly forgotten until Matt stepped in. Beefeater Gin, Luxardo Maraschino, Fresh Raspberries, “Fresh Sour.” Very good balance of flavors, with a lovely deep pinki-red courtesy of the muddled raspberries. Light froth on the top. This one doesn’t come out as citrusy as a classic Aviation. Recommended. Overall, very good drinks, though I have to critique the bartender (sorry, it has to be done!). I’m guessing he was a day-shift bartender, and while attentive and friendly, he admitted, after a brief chat, that he hadn’t mixed cocktails very often, and people seldom ordered them, so he was a little inexperienced at mixing. Understandable, given it’s a bar on the resort/casino floor and you’ll mostly get orders for simple highballs, beers, and wines. All of our drinks were free-poured, and counting pours is tough without pour spouts, but the drinks turned out remarkably well despite the inaccuracy. You could measure by the height in the mixing glass, I suppose, but that’s unlikely. He also kept checking the menu to see what to add in next. I didn’t lecture him or anything (I’m not that cruel! ), but a couple corrections and questions were made. We had a good time, nonetheless, and I hope the drinks menu does nothing but improve at Moderno, and their original cocktails are very intriguing. I’d have ordered one more if we’d had the time. Incidentally, I heard of Moderno through an article on Drink Spirits found after a quick Google search on craft cocktail bars in Vegas. We only stopped by one other on the list, Vesper, but that’s coming up in Part 3 of the Vegas Series. Stay tuned! 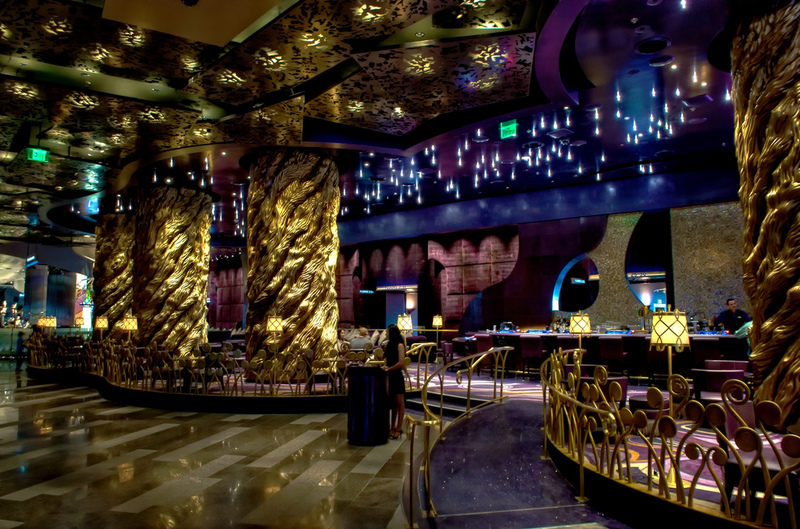 This entry was posted on August 29, 2011 by IJ Lauer in Bar Visit, Las Vegas Bars and tagged aria, bar, bar moderno, las vegas, visit.